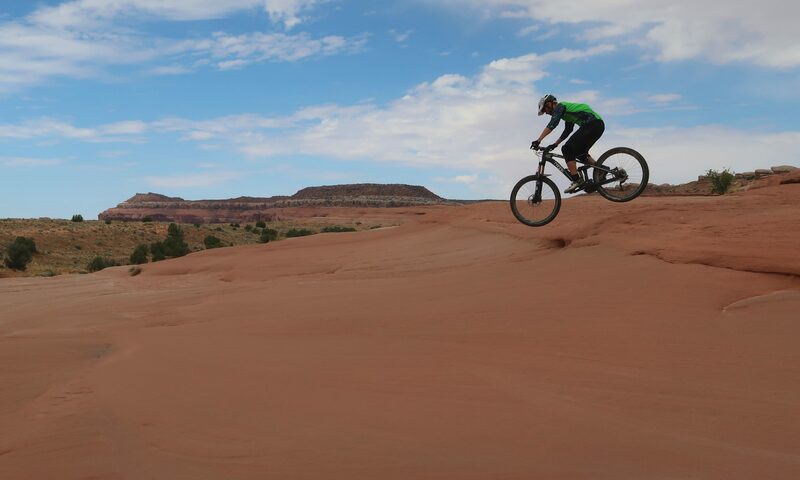 Fruita isn’t that big, but in terms of trails it has a lot to offer. I love the 18 Road trails. They are very smooth and easy – even for beginners – but they are a lot of fun. Zippity Do Da is simply outstanding. Riding down the ridge you sometimes feel like on a different planet. And the PBR-Trail (Pumps, Berms and Rollers) is even easier and faster. The Kokopelli-Trails are located further west and on the other side of the interstate are little more technical with steps and drops and more rocks. The scenery overlooking the Colorado River is magnificent. My favorite trail is the Horsethief Bench Loop. The challenge is right at the beginning when you drop down from Mary’s. Well, and I didn’t dare the lower part. Instead I got a lesson from another biker, who showed me how to drop down a rock wall.